An ambitious piece of work which blends all the elements which give Progressive Metal its distinctive quality.. Some Female-Fronted Progressive Metal from Sweden? Why not! Concept album? Sure, fire away! First things first, check the cover; a lone, shadowy figure looks towards a high rise city, buildings aflame and smoking. Ominous and rightly so, it's a story which revolves around our hero/heroine whose mental breakdown is tracked on 'Anima' and whose incarceration after a failed attempt to change a decadent and depressing world results in the decision to erase everything in an apocalypse. 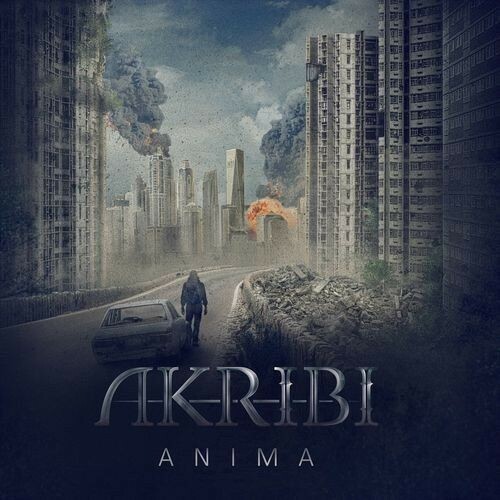 Akribi translates into accuracy and attention to detail and the band employ a similar philosophy in playing out a musical portrayal of the gradual breakdown of the main character. A hard-edged six-piece fronted by the now (almost) obligatory female vocal and focal point of Jessica Ahman. The music shifts through a range of styles and arrangements, from the aggressive and heavy to the melodic, more ambient and delicate. They open proceedings with an instrumental overture 'The End', a prelude to the first utterance of "I just can't take any more" on 'New Definitions Of The Truth' which includes some intricate guitar and keyboard interplay that may just sound very familiar to Dream Theater watchers. For all the efforts to present a thematic album, the songs easily stand alone. It's all very technically impressive and powerful Prog Metal, with some added drama to boot as the storyline takes hold. Whilst 'Every Man For Himself' might be more in the direction of heavy Thrash, really pushing the vocal to the very edge at some points, 'Isolation' is more mid-paced offering with its balladry and atmospherics providing a welcome change of mood, although it's still punctuated with some chunky riffs and a throaty roar or two. The technical wizardry of the instrumental 'Down The Rabbit Hole' evolves into an acoustic introduction to the more peaceful 'The Wastelands' and, before you know it, the curtain call of, funny enough, 'Curtain Call' and 'The Last Goodbye' combine to form a fifteen minute conclusion. Snippets of sound bites make their way into the piece which makes steady progress towards the expected climax and rounds off an ambitious piece of work which blends all the elements which give Progressive Metal its distinctive quality.